Mobile is full of artistic souls and spaces sure to quench your cultural thirst. Downtown is home to a wide variety of studios and centers featuring murals, sculptures, paintings, abstract art and more. Theater buffs and musical mavens alike will find something they enjoy, whether it be seeing a performance at the historic Saenger Theatre or taking in the Mobile Ballet. 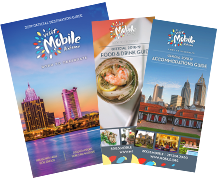 Mobile's creative community is thriving and visitors will not want to miss the dozens of arts-related events and activities that take place around town. Every second Friday from 6 p.m. to 9 p.m., downtown Mobile comes alive during the wildly popular ArtWalk, where thousands of folks gather to enjoy the latest in local art, music, food and culture. Stroll along, browsing eclectic local galleries, public spaces and pop-up markets at your leisure. Much like the city of Mobile itself, ArtWalk showcases immense diversity; visitors will find both the contemporary and traditional, from down-home crafts to elegant furnishings, while enjoying anything from street food to sophisticated hors d&apos;oeuvres. The community-wide art show is a perfect way to rub shoulders with locals while getting a taste, ear- and eye-full of the funky, Southern charm that our Bay culture has to offer. For a map and complete list of activities on the day of, check out www.ncsmobile.org.